Benedetta Ubertazzi, an Assistant Professor of International Law at the Faculty of Law of the University of Macerata (Italy), has published a book titled “Exclusive Jurisdiction in Intellectual Property”. The issue of exclusive jurisdiction in intellectual property matters, especially those related to existence and validity of intellectual property rights, was revived in the recent years due to several important court cases, including the CJEU judgment in GAT v. LuK, the US ruling in Voda v. Cordis, and the UK decisions in Lucasfilm v. Ainsworth. 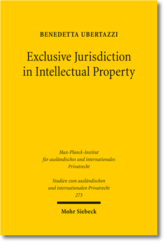 In this book Benedetta Ubertazzi argues that the grounds regularly invoked to support the exclusive jurisdiction rules related to intellectual property rights do not stand the test of justifiableness. Moreover, she purports that such exclusive jurisdiction should be abandoned because it runs contrary to public international rules concerning the avoidance of a denial of justice. The book is published in 2012 by Mohr Siebeck as 273rd title in a series of books Studien zum ausländischen und internationalen Privatrecht (StudIPR) and available for order here, also as an e-book. The article by the same author on this topic was published in 15 Intellectual Property L. Rev. 357 (2011) and available here.